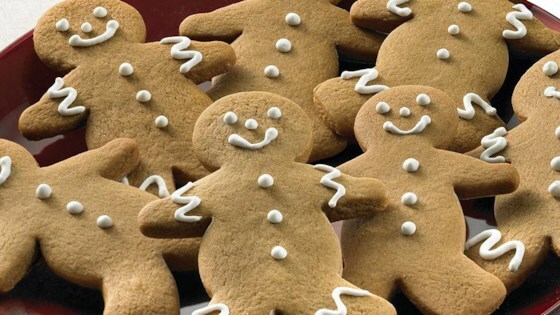 "These Gingerbread Men Cookies are as cute as can be. If desired, decorate with raisins, currants or cinnamon red hot candies for eyes and buttons. Or, pipe untinted or colored icing onto cookies." Mix flour, ginger, cinnamon, baking soda, nutmeg and salt in large bowl. Set aside. Beat butter and brown sugar in large bowl with electric mixer on medium speed until light and fluffy. Add molasses, egg and vanilla;mix well. Gradually beat in flour mixture on low speed until well mixed. Press dough into a thick flat disk. Wrap in plastic wrap. Refrigerate 4 hours or overnight. Bake 8 to 10 minutes or until edges of cookies are set and just begin to brown. Cool on baking sheets 1 to 2 minutes. Remove to wire racks; cool completely. Decorate cooled cookies as desired. Store cookies in airtight container up to5 days. White Chocolate Kissed Gingerbread Cookies: Prepare and refrigerate dough as directed. Shape into 1-inch balls. Roll in granulated sugar. Place 2 inches apart on ungreased baking sheets. Bake in preheated 350°F oven 8 to 10 minutes or until edges of cookies just begin to brown. Immediately press a white and milk chocolate swirled kiss-shaped candy into center of each cookie. Remove to wire racks; cool completely. Makes 5 dozen. Gingerbread Whoopie Pies with Lemon Creme: Prepare and refrigerate dough as directed. Shape into 1-inch balls. Roll in granulated sugar. Place 2 inches apart on ungreased baking sheets. Bake in preheated 350°F oven 8 to 10 minutes or until edges of cookies just begin to brown. Remove to wire racks; cool completely. For the Lemon Creme, mix 1 jar (7 ounces) marshmallow cream, 1/4 cup (1/2 stick) butter, softened, 4 ounces cream cheese, softened, and 1 teaspoon McCormick® Pure Lemon Extract in medium bowl until well blended. To assemble whoopie pies, place about 1 tablespoon filling on the flat side of 1 cookie. Top with a second cookie, pressing gently to spread the filling. Roll edge of whoopie pie in 1 cup crushed peppermint candy. Repeat with remaining cookies, filling and candy. Store whoopie pies between layers of wax paper in airtight container in refrigerator up to 5 days. Makes 2 1/2 dozen. Caramel Pecan Gingerbread Thumbprints: Prepare and refrigerate dough as directed. Shape into 1-inch balls. Place 2 inches apart on ungreased baking sheets. Bake in preheated 350 degree F oven8 to10 minutes or until edges of cookies just begin to brown. Immediately press a pecan half into center of each cookie. Top each with 1/4 teaspoon of caramel topping. Remove to wire racks; cool completely. Drizzle cookies with 2 ounces semi-sweet baking chocolate, melted. Let stand until chocolate is set. Makes 5 dozen. Almond Gingerbread Cookies: Prepare and refrigerate dough as directed. Shape into 1-inch balls. Roll in 1 1/3 cups sliced almonds, pressing almonds into dough. Place 2 inches apart on ungreased baking sheets. Bake in preheated 350 degree F oven 8 to10 minutes or until edges of cookies just begin to brown. Remove to wire racks; cool completely. Makes 5 dozen. I have tried this recipe twice and both times the dough turns out very dry and crumbly. I would not recommend this recipe. Made these last Christmas. Easy and delicious. Made this recipe two days before Christmas. Followed recipe exactly. These were the best. Throwing away any previous recipes I had for gingerbread cookies.